Monongahela Valley Hospital staff and Carroll Township Police will work together on the 7th National Prescription Drug Take Back Day, a convenient and safe way for residents to remove unused drugs from their medicine cabinets, on Saturday, Oct. 26, from 10 a.m. to 2 p.m. The event will be held on the hospital campus at the circular driveway area outside of the Anthony M. Lombardi Education Conference Center. Participants can again remain in their cars and hand unwanted drugs to the police officers through their windows. Carroll Township Police Chief Paul Brand said at the last collection in April, people were very willing to share their stories with him. “One woman told us that she was dropping off the unused pills of her deceased husband; while another man told us that he was glad to give us his cancer meds because he was in remission and no longer needed them,” said Chief Brand. Carroll Twp. 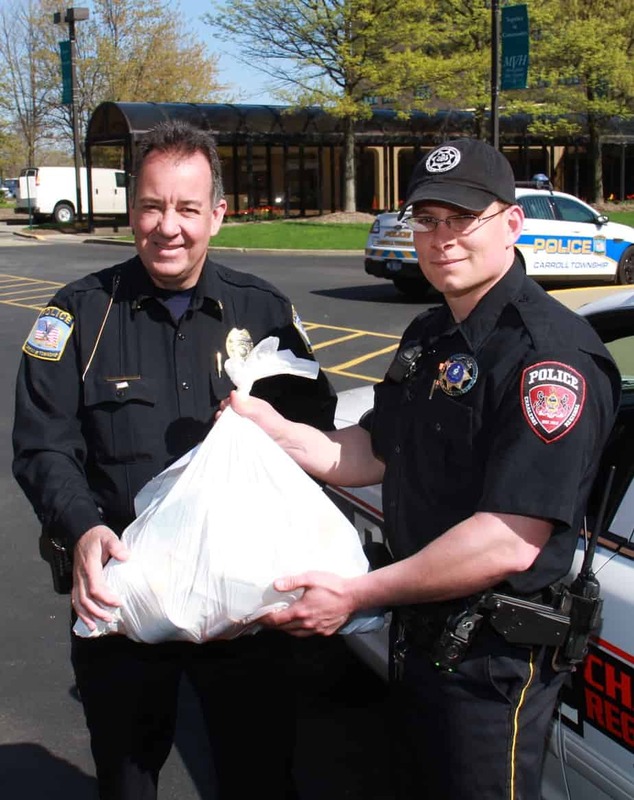 Police Chief Paul Brand and Officer Ryan Brand of Charleroi display one of the bags of drugs donated to the 6th National Drug Take Back Day in April. He added that there are times when people might start a prescription and after a while, their physician will tell them to stop or to try something else; he said those extras need to be removed from homes. Before visiting the collection site on Oct. 26, participants should remove any personal information from the bottles or packages of expired, unwanted or unused controlled, non-controlled or over-the-counter medications. Liquid products and creams in their containers will be accepted. Donors remain anonymous and police will not request identification. Sharps and syringes will not be accepted due to the potential hazard posed by blood-borne diseases. Afterwards, law enforcement officers will then seal the boxes containing the collected medicine and the Drug Enforcement Administration (DEA) will weigh the boxes and safely dispose of the items. According to a 2011 Substance Abuse and Mental Health Services Administration study, twice as many Americans regularly abused prescription drugs than the number of those who regularly used cocaine, hallucinogens, heroin and inhalants combined. That same study revealed that more than 70 percent of people abusing prescription pain relievers got them through friends or relatives, a statistic that includes raiding the family medicine cabinet. At the most recent Drug Take Back Day in April, the DEA collected 742,497 pounds — or 371 tons — of prescription medications at more than 5,829 locations. Over the short life of the program, more than 2.8 million pounds — 1,409 tons — of prescription medications were removed from circulation. To find other collection sites, search by zip code at www.deadiversion.usdoj.gov, scroll down to the “Got Drugs?” ad and then choose “locate collection sites,” or call 1-800-882-9539.